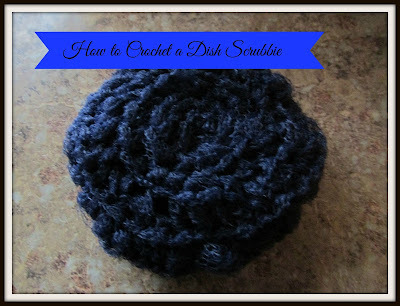 The prizes for bingo the other night at church were dish scrubbies and crocheted dish cloths. I won but gave mine to the next winner and just asked for the pattern. I've always wanted to make one of these and now I'm on a roll! Row 3- 2 sc in each stitch - 16 sts. Row 4- 2 sc in each stitch - 32 sts. Row 9- 1 sc in every other stitch - 8 sts. **I found an easy way to cut the netting to make dish scrubbies. Here is my tutorial here.